Halloween candy can be toxic to pets. Keep chocolate away from dogs and cats! Dark or baking chocolate is especially dangerous. Some candies may contain the artificial sweetner xylitol which can lead to serious consequences in dogs such as very low blood sugar and liver injury. If you suspect your pet may have ingested any toxic treats, please call our Emergency and Critical Care Service at (334) 844-4690. Pets especially ever curious kittens may become tangled in Halloween decorations. Decorations containing string or rope can entangle pets and may be deadly if ingested. Candles inside jack-o-lanterns can pose a fire risk if knocked over by a curious pet. If possible, keep pets away from decorations. While making your pet wear a costume can be a lot of fun, some pets do not share the same enthusiasm. For some, a costume can be very stressful. 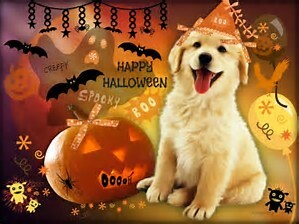 Ensure that the costume does not limit your pets ability to breathe, see, or move freely. Be vigilant and ensure the costume does not became a choking hazard or lead to an obstruction of their digestive tract if eaten. Always supervise a costumed pet. Halloween can be a great holiday for the entire family. However, the things that humans enjoy most about Halloween like the hordes of trick-or-treaters, fun smells, and spooky noises can be truly frightening for our pets. Please consult your veterinarian if your pet may be prone to fear and anxiety during the Halloween season.